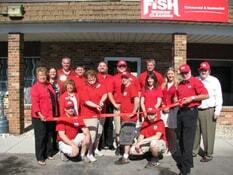 Click here to view Fish Window Cleaning's Press Kit. For media inquiries, please contact us at pr@fishwindowcleaning.com. Climbing The Ladder... Literally. The Mistake Most Of Us Make. Click here to watch the WFMY News 2 video and read the full article. Why am I always hitting cleanup? Click here to read the full article in The Augusta Chronicle. "When a company is sold, having the outgoing and incoming owners overlap can help employees adjust to the new boss. Trent Peneston joined the Fish Window Cleaning franchise in Houston as general manager, and after a transition period, the previous owner retired. 'We thought that would help with the anxiety. And it worked out,' Peneston says." Click here to read the full article on Yahoo! News. 6/2015 Fish Window Cleaning: We do windows! 4/25/2013 A Crystal Clear View & a Giveaway! 11/26/2012 Q Chamber's Holiday House Tour: Come And Take A Peek! 10/4/11 Calling all Creative Kids!